The best innovations spring out of our desire to avoid boring, repetitive, drudge work. This is why we bring you (*ta da! *) report parts. With the latest version of ActiveReports, you can fill your Reports Library with chunks of your existing reports that you already spent the time and effort to perfect. Now you can reuse those objects, including any connected data and resources, without having to recreate and reconnect them. You can just drag them from the Reports Library and drop them onto your reports! A report part can be a Map, a Chart, FormattedText, Labels and TextBoxes, or even a Container with other controls nested in it. 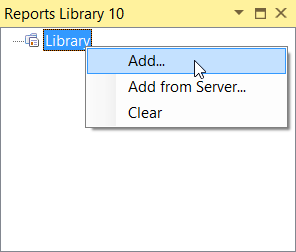 To fill your Reports Library, right-click it and select Add or Add from Server. Hint: If your Reports Library window isn't showing in Visual Studio, click the View Reports Library button in the ActiveReports 10 toolbar. If you also use ActiveReports Server, you can use report parts from other report developers, too. Select Add from Server and the login window appears if you're not already logged in. Then you can navigate to the report you want, select it, and click Open. It polls the entire report and brings in all of the report parts that are supported for that report type. The Report Library presents report parts in a treeview with the report as the parent node. 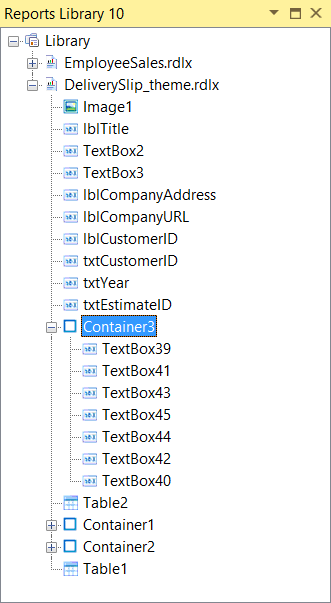 Notice that any nested report parts are presented as nodes under the containing report item. You can drag the top-level node onto your report and it will bring along all of the nested report items, or you can drag the smaller nested pieces out individually. If you have report items that you know you won't use, you can right-click them and select Hide to de-clutter. Now that you have a Reports Library stocked with report parts, you can make a new report in minutes. One caveat: You can only use report parts from Section reports in new Section reports, and Page/RDL report parts in Page/RDL reports. Drag report parts from the Reports Library and drop them onto your new report. Voila! Instant gratification. When you drop the report part onto your new report, take a look at your Report Explorer. Notice that any required data source and data set is added automatically. Now that you have the report part in your new report, it is disconnected from the original report, which means that you can tweak it without affecting the original.